Our 2nd FPU class was last week. I didn’t get to attend the first class because the little guy was sick. 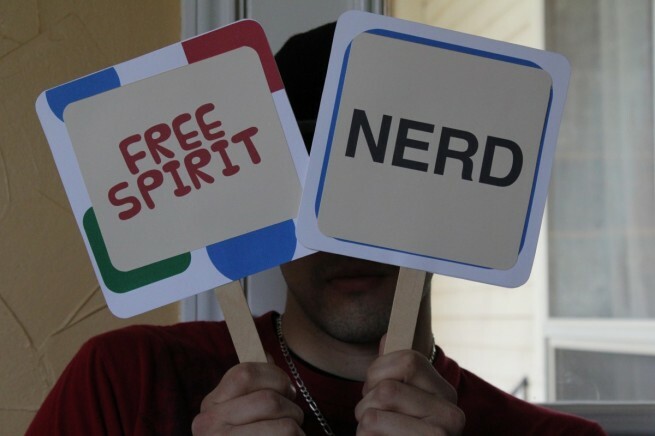 Week 2 is ‘Relating with Money’ Nerd and Free Spirits unite. I made these awesome signs for everyone to hold up during the class. I’m trying to incorporate more props to make it a hands on experience. $1000 emergency fund in the bank. Completed September 2010. Pay off all debt (except the house) using the debt snowball. Completed September 2011. Fully funded emergency fund of 3-6 months of expenses. (Because of our circumstances we are going for 12!) THIS IS WHERE WE ARE AT! We have reached a goal & are now putting my checks straight to the savings & living off of Jared’s income! We are still putting all ‘extra money’ into our baby step 3. We got a refund from Jaidan’s pediatrician of $35 & it went straight to savings along with $136 that was over budgeted for our electric. I made $68.11 working in the church nursery that also went to savings. Although we are no where near retirement it’s time to start investing 15% of our income! Start paying off the house early! What could we do without house payments?? Oh don’t even get me started! I cannot WAIT for that! Baby Step #7: Build wealth & GIVE! Find an FPU class in your area! This is our Journey through FPU! I'm Rachel. In my 32 short years of life I've learned to never say never, go with the flow of life and to cherish every moment with the people I love. I'm all about learning... especially how I can be more faithful to God. We are currently in baby step 4, & 5 of FPU. I love photography, organizing, making photo books, homeschooling my kids & learning about natural living.